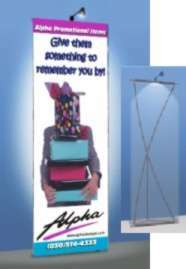 Xtralite Displays consist of aluminum poles that form a popup frame for displaying a custom made poster. The displays start at under $500 and weigh less than 5 pounds. Xtralite displays can be easily packaged in a small thermoplastic tube that can be carried on the shoulder from one tradeshow to another. FLOOR MODEL, TABLETOP, AND MULTI-PANEL MODELS! Click Here for our xtralite price list and sales flyer in Adobe Acrobat PDF format. Adobe Acrobat Reader is required to view the file and is available at www.adobe.com FREE! Click Here to see our graphics on actual Displays!